As an album reviewer, sometimes you get brilliant albums of bands you never heard of, sometimes you get to listen to bands, you'd rather advise to take a change in life; away from music. You get albums that basically write themselves and sometimes you need to listen two dozen times to form a fair opinion. To be honest The Rock Alchemist took me a lot of listening to come to an honest verdict. Hailing from Italy the quintet already exists from 2009 on and have released their debut in 2012. Their latest effort; Elements was picked up by Lion Music and released in 2017. 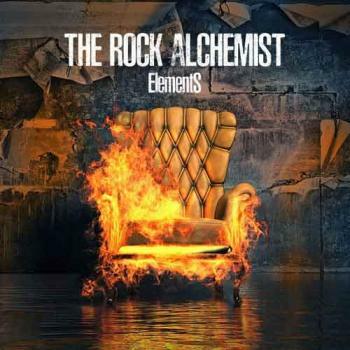 Within the thirty-one minutes that clocks the album, The Rock Alchemist shows several different musical faces; Panic Room, the opener gives the impression the band plays a melancholic style of progressive rock. A nice opener, only vocalist Aldo Garrone uses a kind of vibrato that you just have to love. The following track; A-Matrix however is a wonderful smooth , slightly progressive pop rock ballad. Bands like REM and Candlebox come to mind listening to this very accessible composition. The guitar solo by Beppe Geracitano nicely contrasts to Dave Grandieri's piano playing. Cars adds a hunch of Pearl Jam to The Rock Alchemist's influences. This alternative track displays a nice bass by Raoul Ronco, who forms a solid rhythm section with drummer Max Gordiani. When we arrive at Phoenix, the progressive rock basics returns, powerful parts and delicate keyboards pave the way for Aldo Garrone, who seems to have lost the vibrato he heavily used on the previous tracks. The funny thing is, when you want to discuss the vibrato thing, during the more progressive rock songs, it does annoy me after a while, but on the other hand, during the more alternative, pop rock tunes, it doesn't seem to bother me at all. The just over one minute clocking Thrilling Countdown can be seen as a smooth interlude and not as a kind of intro for the following 27. 27 returns to the alternative pop rock of afore mentioned compositions; great songs for playing live at festivals, for sure and again a very nice guitar part. Eclipse starts as a sort of piano ballad, a ballad that slowly gains on power and intensity. A little roughness in Aldo's vocals and again a very interesting guitar solo makes this song one of the most interesting of the album. The final track on the album is called The Temple and shows a typical Italian kind of bombast in a rather smooth melodramatic song. After several listens I start to wonder if this song would have had more impact when it was sung in the band's native language. Elements set me on the wrong foot, with their opener, the album does hold lots of progressive rock elements, but the majority seems to be alternative, pop rock compositions with “Italian” vocals and wonderful guitar playing. Elements is an album that is quite accessible to non prog listeners, but the progressive rock aficionado needs to listen first, before purchasing.